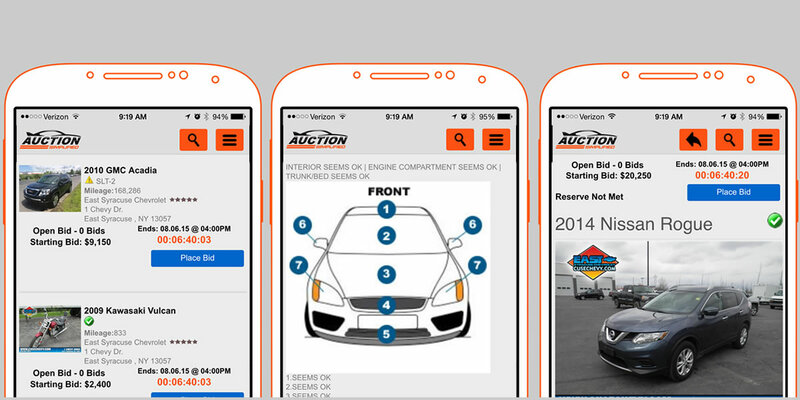 Dealer Simplified LLC, announced version 3.0 of their Dealer Auction Smart Phone App. With version 3.0, Auction Simplified leverages it’s partnerships with companies like vAuto, CarsforSale, VinSolutions and DealerTrack among others to make the vehicle launch and integration seamless for the seller. V3 is essentially an all new app. With it, the seller can, create condition reports, update existing photos, add RO’s, offer bid assurance and manage their auction from any modern smartphone, or tablet. “Integration with our partners is the key, because we avoid duplication of data entry. Example, if the used car manager appraising the car does a great job of booking out the vehicle in vAuto, the wholesale manager can recall that data in Auction Simplified, tweak the condition report and launch the car on their auction in moments.” Said Phil Gates, CTO of the company. In the past dealers would have to fill in a paper condition report and take photos with a digital camera then spend the second half of their day typing out the details again at their desk computer. Dealers using Auction Simplified, can provide their marketing staff with an iPad mini and load the vehicles right from their wholesale lot in half the time. This version also includes several upgrades to the buyer experience, allowing wholesaler and independent dealers the ability to bid from the car while they are attending dealer bid sale auctions. “Our company focuses heavily on the wholesale buyer experience. After all, the buyer is the most important part of a successful wholesale auction. We want the buyer experience, while bidding on dealer auctions, to be smooth and quite frankly ‘Simple” said Kevin Leigh, Cofounder of the company. In version 1 and 2, the app focused on allowing buyers to view condition reports and search for vehicles of interest (SRP), view vehicle details (VDP) and of course bid, via our silent, open bid, make an offer or buy it now auctions. Now with v3 the auction platform is a full buyer and seller B2B app. The App is available for IOS and Android. Auction Simplified also offers it’s highly responsive web app, with essentially is available on any web enabled device. Dealer Simplified LLC, serves as the nation's core marketplace for dealer held bid sales and auctions. Since its inception last year, more than a thousand wholesale buyers have registered for the service which provides dealers and wholesalers a business to business marketplace. Auction Simplified’s dealer auction service is primarily focused on the north east but recently held auctions in Arizona and Texas. For dealers already running a bid sale, Auction Simplified enhances the existing pen and paper style by adding hundreds of online national buyers from their wholesale marketplace. Using the velocity approach to wholesale, cars are online in front of buyer’s sooner and are sold faster. It's absolutely free to selling dealers. No seller fees, software fees or set up fees. Their industry veteran trainers will have your auction up and running in no time. The buyers fees are tiny, as low as $45 and since it is less expensive for the dealer to sell; prices are lower. The “Simplified” software requires less of a learning curve so dealer can be up and running in moments, however, Auction Simplified is committed to providing ongoing training, proactive coaching and support to ensure dealers achieve results they never thought possible.